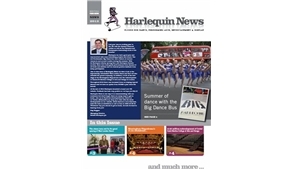 Here's the latest edition of our newsletter - Harlequin News. Grand opening of West London Dance. Redevelopment of Central Saint Martins College of Arts and Design. Harlequin Hi-Shine at The Young Vic for 'Feast'. Universal Ballet travels the world on Harlequin. The Australian Dance Awards 2012. Scholarship awarded at the Prix de Lausanne 2013. Renton Dance Studio and their Harlequin floor. New Harlequin Vitality - available in a handy pack! RIBA CPD is now online. A printed floor for The Bolshoi Ballet. Why Riverdance tours the world on Harlequin Cascade. Artistic Director at Sydney Dance Company, Rafael Bonachela, talks about why he chose a Harlequin floor. 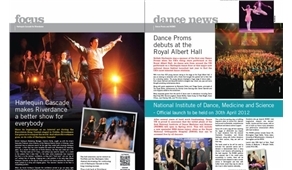 Pre-launch information about the National Institute for Dance Medicine and Science. IADMS Conference in Washington DC. Burn The Floor uses Harlequin Reversible on tour. Northern Ballet and Phoenix Dance Theatre choose Harlequin WoodSpring sprung floors, with Harlequin Studio surface finishes. Beijing International Ballet and Choreography Competition. 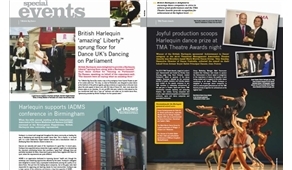 Here's the first issue of our re-launched newsletter, Harlequin News, which brings you Harlequin stories from around the world. Royal Academy of Dance - "Supper with the Stars"